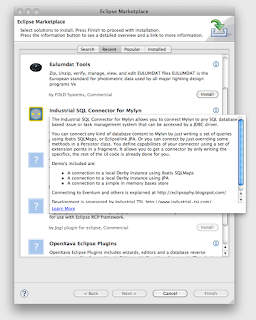 Have you also created plugin that you want to make easy to install? 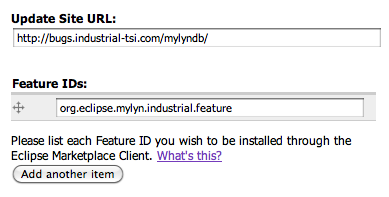 Then make sure your plugin is listed at Eclipse Marketplace and add the feature ids of the base install from you site.xml. 5 minutes work that make it a lot easier for your users! I received a mail recently from the ever active Lynn Gayowski, the Marketing Events Manager for the Eclipse Foundation. The upcoming Helios release is one huge event and everybody in the eco system can be involved, either by testing the milestones or by preparing for one of the exiting UI improvements in Helios: the Eclipse Marketplace client. 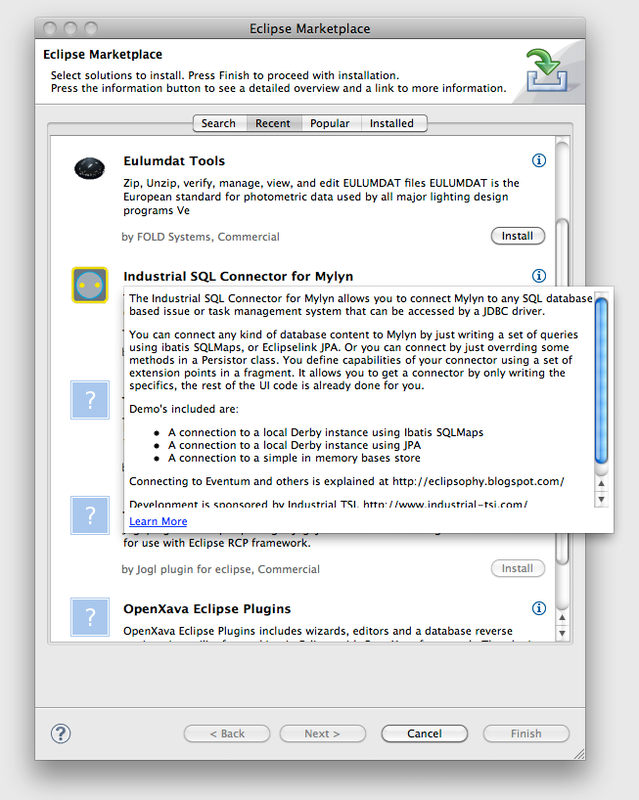 Until now you could lookup a plugin on the marketplace and then use the update site for that plugin to install it in your eclipse. A complicated process that involves webbrowser, search, copy, eclipse, add update site, paste, select, install, restart. This quickly adds up to several minutes. In Helios this is all replaced by a single menu selection Help/Eclipse Solution Catalogs. Only 5 minutes to set up! 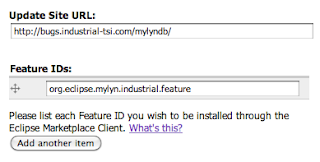 Lynn requested that I provide information to make this client also show the Industrial SQL Connector for Mylyn that I have blogged about here in the past. The steps to take are clearly described here. It is basically copying the feature id's from your site.xml to the data in the market place. All in all it took me just 5 minutes to set up for two solutions I manage, including editing the descriptions in HTML to look nice in the information hover, and adding an image. Thanks for the tip Lynn! We are really excited the Eclipse Marketpalce client. Thanks for adding your product and blogging about how easy it was!! !